This page didn't score very high on mombubot for the plural version of "carriers" but when you remove the "s" the score increases to 7. Also on the search engines, when the "s" is removed from the search the page ranks in the top 10. 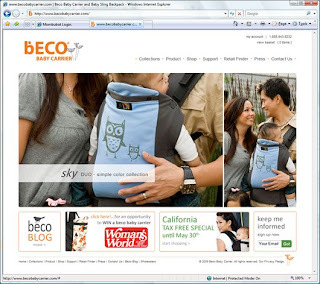 So here is the question: "What are people most likely to search for 'baby carriers' or 'baby carrier'". I would suggest that people would first search for "baby carriers" as most would like a variety of carriers to choose from. So with a simple change in targeted keywords this page could be better positioned for its audience. This page also provides a good example of how to use flash images with external text around the image. However, this page does use tables for layout and could gain some lift by converting it to css layout. If you are getting good viewing of your web pages, perhaps you could do a little better and get more? The little things really add up.